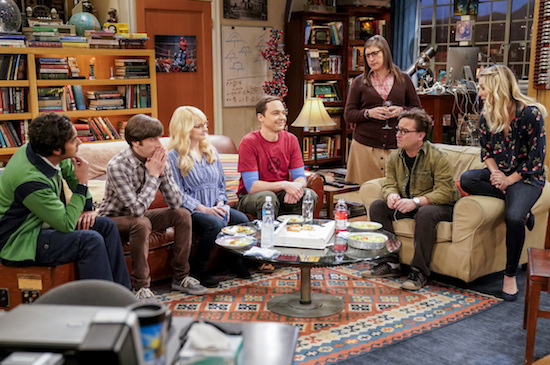 “The Gates Excitation” – Pictured: Rajesh Koothrappali (Kunal Nayyar), Howard Wolowitz (Simon Helberg), Bernadette (Melissa Rauch), Sheldon Cooper (Jim Parsons), Amy Farrah Fowler (Mayim Bialik), Leonard Hofstadter (Johnny Galecki) and Penny (Kaley Cuoco). Penny gets the opportunity to host Bill Gates at work when his company wants to partner with her pharmaceutical company. Also, Leonard, Koothrappali, and Wolowitz do everything in their power to meet him, while Sheldon thinks he is the victim of an April Fools prank. Photo: Erik Voake/CBS ÃÂ©2018 CBS Broadcasting, Inc. All Rights Reserved. THE BIG BANG THEORY will conclude with its upcoming season, CBS and Warner Bros. announced.